Georges Seurat, Port-en-Bessin, Outer Harbour (High Tide) (1888), oil on canvas, 67 x 82 cm, Musée d'Orsay, Paris. Wikimedia Commons. Every painter is aware of the limitations of, and compromises in, trying to represent the three-dimensional on a two-dimensional surface. Yet, at least until the twentieth century, surprisingly few painters have explored techniques which could help the viewer reconstruct the 3D space. A very few paintings have tried to use multiple views: I have been unable to locate an image of one notable example, Jacob van der Croos’ View of The Hague, with Twenty Scenes in the Neighbourhood (1661-3), which consists of a central and conventional landscape view, around which there are twenty smaller canvases showing those local views. This approach was used by print-makers and illustrators to enhance their topographic views, but does not appear to have been tried by other painters. In the early twentieth century, of course, the Cubists and related movements tried to show multiple facets or views within their motifs, and this extended to landscapes by the likes of André Lhote (still protected by copyright). Thanks to the careful work of Michelle Foa, published this year and reviewed here, we now know that the leader of the Neo-Impressionists was an early innovator in this respect. 1890 – Gravelines, where he produced four. He died suddenly and unexpectedly in the spring of 1891, before he could paint any further such series. Although sometimes termed studies, each of these paintings is very much a finished work, albeit smaller and less ambitious than some of his Paris scenes, particularly the most famous La Grande Jatte (1884-6). Constructed using his painstaking application of small patches of oil paint on canvas, Seurat clearly spent a great deal of time and care on them; they are nothing like the quick croquetons which he used as studies for his large paintings such as La Grande Jatte. Foa compares the coastal paintings with old photographs, and demonstrates that Seurat was also extremely careful to make them faithful representations of reality. Perhaps the best way to introduce Michelle Foa’s case that Seurat was examining ways of helping to create a 3D space from multiple 2D images, is to look at a pair of paintings from the 1886 series in Honfleur. 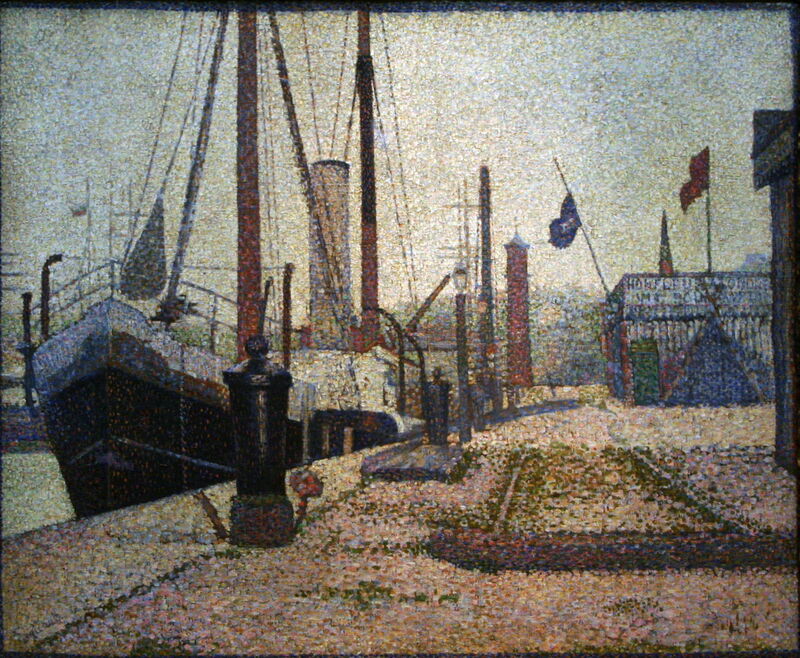 Georges Seurat, Corner of a Basin, Honfleur (1886), oil on canvas, 79.5 x 63 cm, Kröller-Müller Museum, Otterlo. Wikimedia Commons. Corner of a Basin, Honfleur (1886) shows a ship, bows towards the viewer, tied alongside a quay, starboard side to, and looking head-on. There are some buildings on the quay, which are cut off by the left edge of the canvas, and immediately in front and to the right of the viewer are the bows of a sailing ship, also moored. Although the painting is not as clear as it might be, the ship in the centre of the view appears to be a cargo vessel with both sails (masts, rigging) and the funnel for a steam engine. Seurat paints it with a distinctive livery of white superstructure, a white line at the base of the fo’c’sle, on a black hull, which is red from just above the waterline down. (It is likely that the ship is only lightly laden, hence high out of the water.) The funnel is white, with a broad black band at the top. 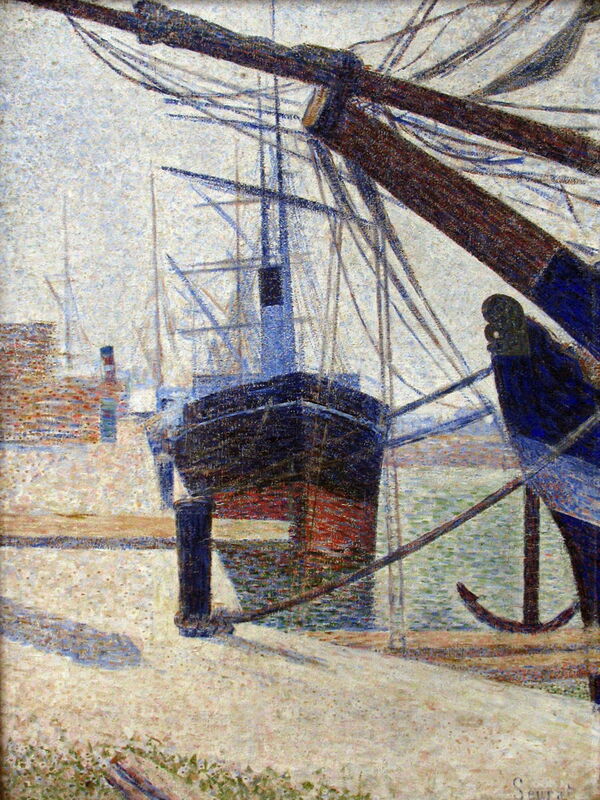 Georges Seurat, The Maria, Honfleur (1886), oil on canvas, 53 x 63.5 cm, National Museum, Prague. Wikimedia Commons. The Maria, Honfleur (1886) appears to be a reverse view of that previous painting, in that the viewer is stood on the same quay, but is on the far side of the ship looking in the opposite direction. The ship is now on the left, and the distant buildings on the right, cut off at the right edge of the canvas. Foa argues that the two ships shown are in fact one and the same. However the Maria (which apparently provides a service to ‘Londres’ via Southampton, according to words painted on the side of the buildings) is quite different in appearance. In this second view, the ship is also shown bows towards the viewer, so the ship must have changed between the two paintings. Next, it is a different type of ship, with simpler sailing rigging, and more dependent on its steam engine. It is now heavier laden, and sitting lower in the water. It has a different livery, with all-white fo’c’sle, and a white line lower down towards the waterline, on a black hull. Its superstructure is also white. The Maria’s funnel is cream in colour, with no black band. There are other differences in details between the two paintings, such as the presence of a street lamp at the edge of the quay in the second, which raise questions as to whether these are necessarily a simple pair of reversed views, which Foa claims. However they do suggest such reversal, which is an unusual way of pairing landscape views. Working through the twenty-four paintings produced by Seurat in these five series, there are many other pairs of reversed views, and evidence of systematic selection of views based not on the aesthetic merits of the views themselves, but of the relationships between the views, and their potential for constructing mental images of the spaces which they represent. I will illustrate this by considering the one series for which I could find a complete set of images. 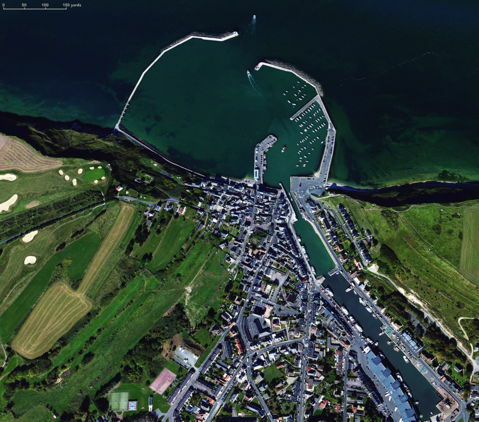 Satellite view of Port-en-Bessin, Apple Maps as at 11 August 2015. Port-en-Bessin is a small port on the northern, Channel, coast, surrounded by moderately high cliffs, and with a distinctive double harbour wall, and inner and outer harbour basins. These are shown clearly in the satellite image, although it is not obvious how much the main features such as harbour walls have changed since 1888. Georges Seurat, Port-en-Bessin, The Jetties (1888), oil on canvas, 54.9 x 65.1 cm, The Museum of Modern Art, New York, NY. Wikimedia Commons. 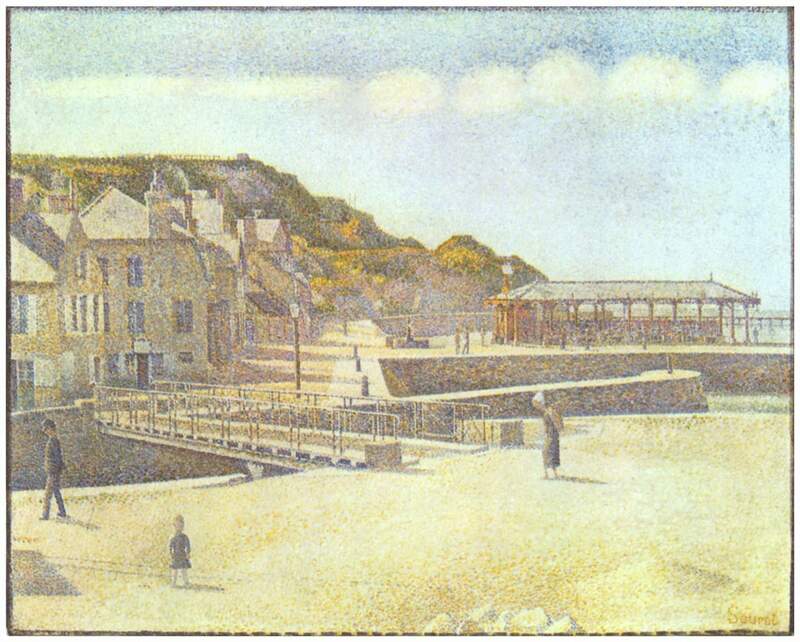 Port-en-Bessin, The Jetties (1888) (referenced as painting 1) is a view looking almost due north into the Channel, showing both arms of the outer harbour walls, the gap between them being fairly central in the painting. The dark areas of water are most probably shadows of clouds, and must not be confused with harbour walls! This view was almost certainly made from a point on the coast to the west of the town waterfront, as it does not show the inner harbour walls. 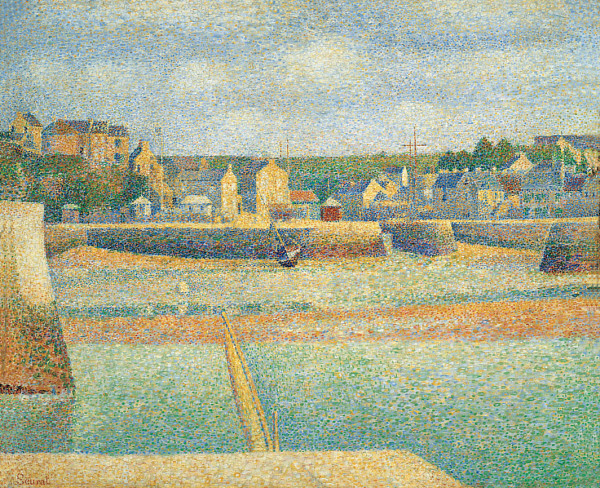 Georges Seurat, Port-en-Bessin, A Sunday (1888), oil on canvas, 66 x 82 cm, Kröller-Müller Museum, Otterlo. Wikimedia Commons. Port-en-Bessin, A Sunday (1888) (painting 2) is a view looking almost due north, but this time from a location inland, near the connection between the inner and outer harbour basins, and shows the channel connecting the outer basin with the harbour beyond, over which there is a footbridge. The glimpse of open sea in the background is the gap between the inner harbour walls. Georges Seurat, Port-en-Bessin, The Bridge and the Quays (1888), oil on canvas, 66 x 83.2 cm, Minneapolis Museum of Arts, Minneapolis, MN. Wikimedia Commons. Port-en-Bessin, The Bridge and the Quays (1888) (painting 3) is a view from just to the east of the entrance to the outer basin, over the footbridge (seen in 2), looking north-west along the line of sea cliffs to the west of the port. Two masts are visible just below the top of the cliffs in the far distance. Georges Seurat, The Grues and the Percée (1888), oil on canvas, 65.1 x 80.9 cm, National Gallery of Art, Washington, DC. Wikimedia Commons. The Grues and the Percée (1888) (painting 4) is a closer view of the sea cliffs to the west of the port, including at the top left corner the two masts seen in the distance in 3. As the outer harbour wall is not visible, the viewer must be located quite deep into the view of 3, and high above the sea. The direction of view is further to the north than in 3. Georges Seurat, Port-en-Bessin, Outer Harbour (High Tide) (1888), oil on canvas, 67 x 82 cm, Musée d’Orsay, Paris. Wikimedia Commons. 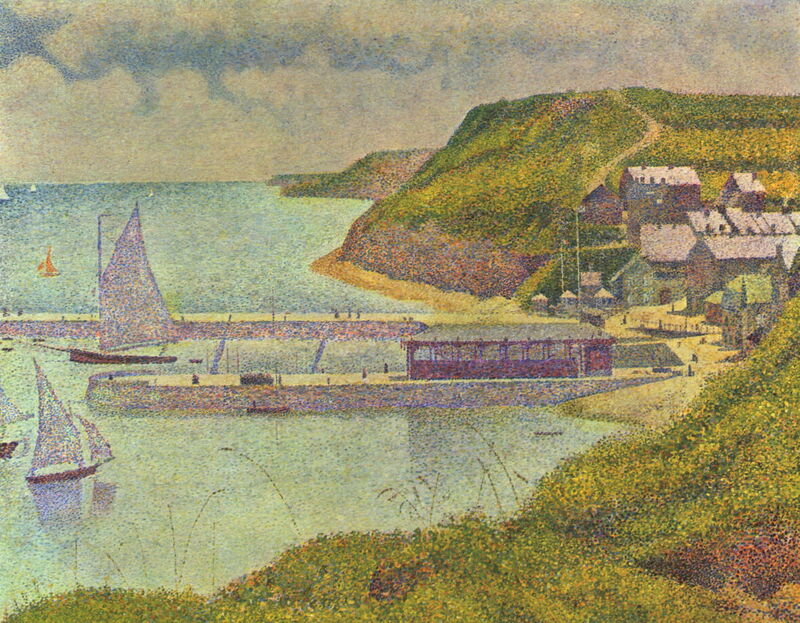 Port-en-Bessin, Outer Harbour (High Tide) (1888) (painting 5) is a view in the reverse direction of 3, looking from a point above the sea to the west of the port due east over the inner harbour, with its prominent market (seen on the satellite image), to the sea cliffs to the east of the port. 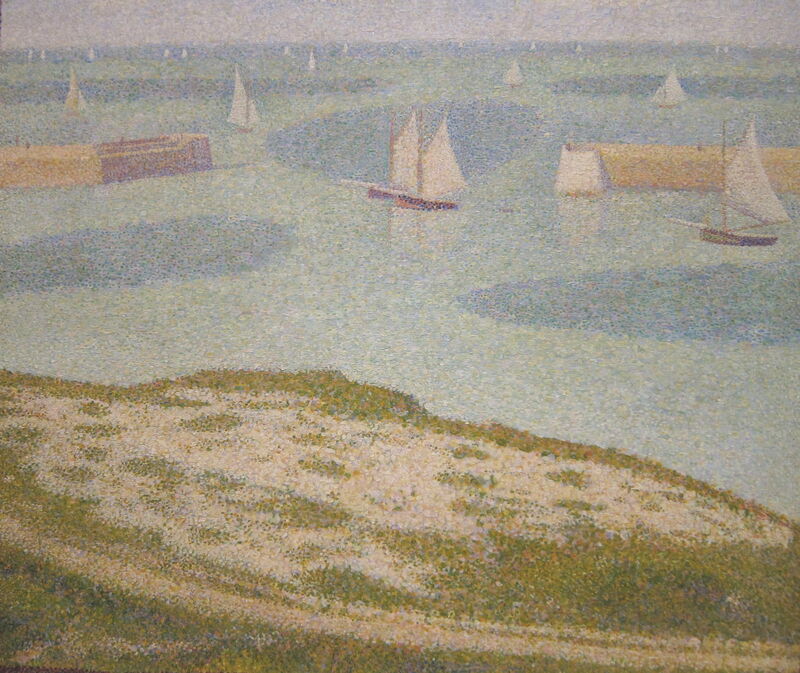 Georges Seurat, Port-en-Bessin, Outer Harbour (Low Tide) (1888), oil on canvas, 54.3 x 66.7 cm, Saint Louis Art Museum, Saint Louis, MO. Wikimedia Commons. 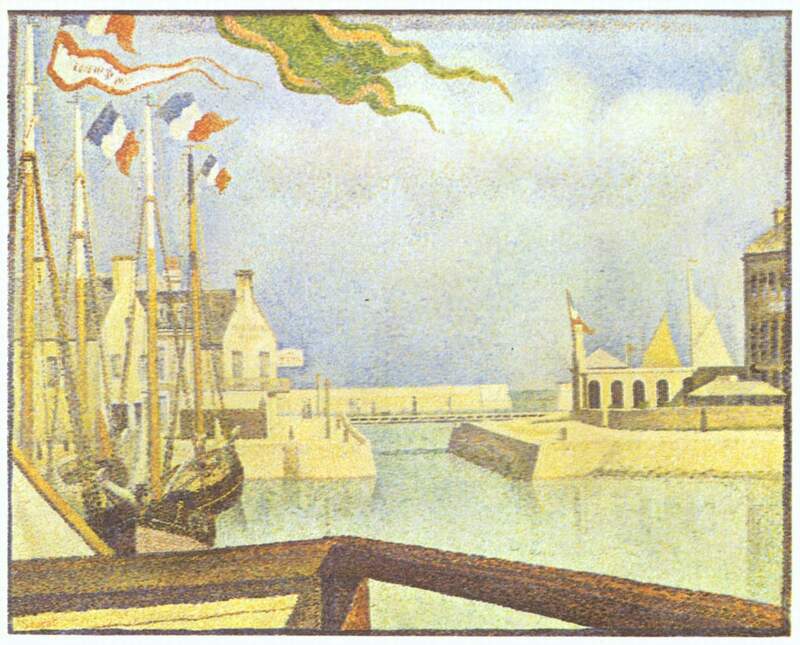 Port-en-Bessin, Outer Harbour (Low Tide) (1888) (painting 6), the final painting in the series, reverses 2, looking from the (eastern) outer harbour wall almost due south towards the entrance to the outer basin. At the time the tide is out, leaving a single boat on the ground, and shallow water inside the inner harbour walls, the ends of which are seen at the edges of the canvas. 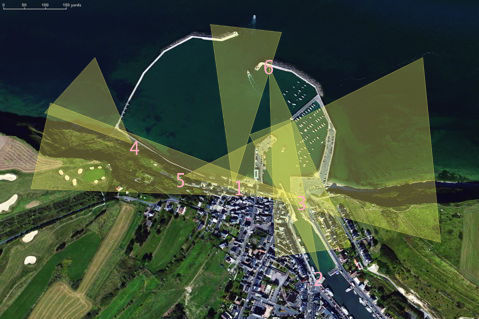 Satellite view of Port-en-Bessin marked up with probable sites and arcs of view for Seurat’s paintings of 1888. The above satellite view is marked out with the approximate view points, each numbered according to the respective painting, and the approximate fields of view shown in each. 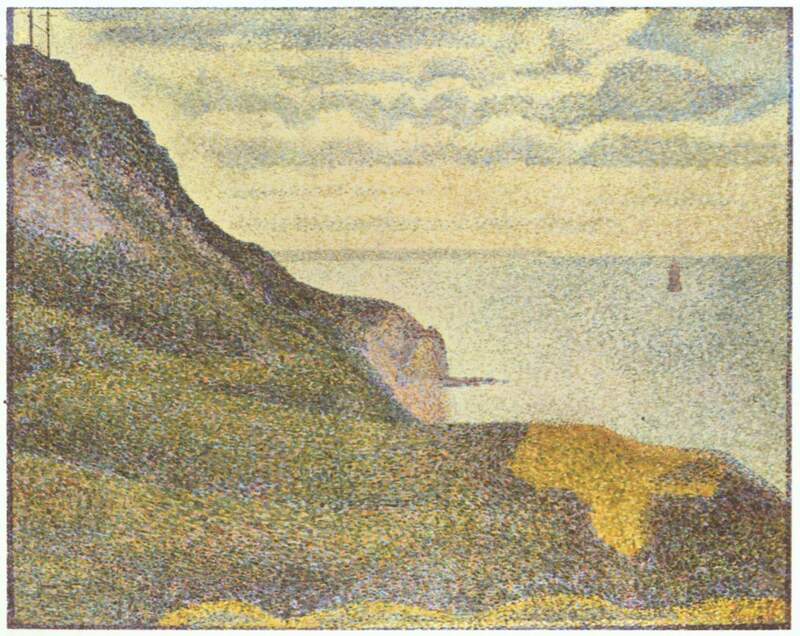 Seurat appears to have deliberately sited each so as to criss-cross the seafront of Port-en-Bessin and the inner harbour, which thus is his focus of attention in the series. Although there may not be sufficient data in his views for formal geodetic construction of a 3D model, after careful study of the series most viewers should have a very clear idea of what is where, and how it all looks from all angles. There is another simple test as to whether the series is sufficient to construct the space within his focus of attention: are there any remaining buildings or other features which have a hidden aspect. Working through each of the visible objects, it is hard (probably not possible) to discover any. For example, the fish market shown on the (western) inner harbour wall is seen from both sides, in 3 (which also shows its southern end) and 5, although 2 and 6 just fall short of showing each of its ends. The footbridge is shown in 2, 3, 5 and 6 (Foa recognises it in only two, though). It is hard to explain the compositions of these paintings unless they were very deliberately made to help construct that 3D space. There are remaining puzzles about the series. Although each is oddly timeless and has at most a light staffage of figures, the sailing boats are more transient, and the flags and pennants shown in 2 tie it to a specific day of the week, Sunday. The paintings lack the activity and bustle which would have been expected of a fishing port, though. The greatest loss is surely that we do not know how Seurat arranged them for exhibition, something which he would have been as meticulous about as in placing their views relative to one another. Now of course the six paintings are also spread across the world, and very unlikely to be seen again in the way in which Seurat intended. Foa M (2015) Georges Seurat: The Art of Vision, Yale UP. ISBN 978 0 300 20835 1. Very few landscape painters seem to have tried novel methods to help the viewer construct 3D space, at least until the twentieth century. The remarkable exception to this was Seurat, whose five series covering ports on the Channel coast of France appear to have been carefully made to enable the viewer to construct 3D space, by means of carefully positioned multiple views. Posted in Painting and tagged 3D, landscape, Lhote, Neo-Impressionism, painting, Port-en-Bessin, Seurat, van der Croos, vision. Bookmark the permalink.